Most restaurants near the University of Oregon close around 11 p.m. That’s a nice, respectable time. But what about those nights that demand you stay up till the crack of dawn? 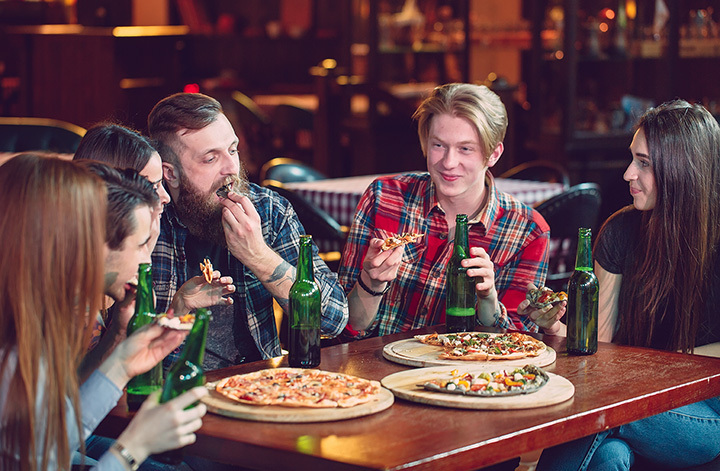 Whether it’s for late-night studying or partying, check out the following 10 best late-night food spots to refuel and keep the good times rolling. Sizzle Pie in Eugene, Oregon, is not like most pizza joints: Sizzle Pie hosts art shows, sells merch, and offers meat pizzas, veggie, seasonal, and breakfast pies. They’re open for dine in, delivery, and takeout until 3 a.m. on weekdays and 4 a.m. on weekends. The Izakaya Meiji Company is open until 1 a.m. every night. They have a special late-night menu that includes ramen, spicy tuna, a burger, whiskey and cookies, and much more. Cornucopia has two locations in Eugene, Oregon, and is home to award-winning burgers. Open until 1 a.m., you’ll have the option of pizza, appetizers, burgers, house favorites, rice bowls, and much more. The Barn Light in downtown Eugene, Oregon, is open until 12 a.m. Monday-Wednesday, 2 a.m. Thursday-Saturday, and 10 p.m. on Sunday. They’ve got a special late night menu that includes biscuits and gravy, pretzel and dip, chili, and much more. Pro tip: Order any sandwich on our menu "Sunnyside" and get a fried egg on top. It is reeeeeeal nice! Agate Alley is open until 1 a.m. every night of the week and serves up dishes with “a touch of Latin and Asian flair.” They’ve got a wide variety of entrees, pizzas, and sandwiches, each made with fresh, organic ingredients. The High Street Brewery and Café is open until midnight on most nights and 1 a.m. on weekends. It is the first microbrewery in Eugene since prohibition, and sells burgers, sandwiches, and house specialties. Craving Mexican food around 2 a.m.? La Noria has you covered. Open until 3 a.m. daily, the restaurant sells quick and easy small plates with a Mexican flair. Perfect late-night bite. Black Forest in Eugene, Oregon, stays open late every day of the week. They host karaoke and regular live shows almost every night. The menu is typical bar food and includes nachos, fries, wings, corn dogs, and more. Delivery is available on their website. Thanks for an amazing performance @scarletsailsband, @radiatorking7 and @synapticbandeugene! Open until 1:30 a.m., Side Bar sells fantastic burgers, appetizers, sandwiches, salads, and more substantial entrees. Don’t be surprised to find the place packed with sports fans any time you come in. The Dough Co. sells calzones and cookies made from scratch, every day until 3 a.m. Choose from over thirty unique calzones and four staple cookies to be delivered right to your door. Check their website for rotating specials.